Bose unveils new Wave III music system and radio with DAB | What Hi-Fi? Bose has upgraded its Wave radio and music system, adding DAB/DAB+/T-DMB tuners and improved FM/AM radio. Artist names and song titles provided by broadcasters are now displayed on the screen, and there's a new touchpad on the top of the unit for on/off control and alarm snooze. You also get dual alarms so different wake-up times can be set to dfferent volumes and different sources. 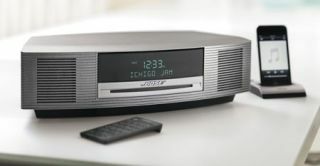 The Bose Wave Music System III includes a front-loading CD player, and costs £600, while the Bose Wave Radio III (without CD player) is £450. Both include an aux input for hooking up a smartphone, iPod, TV or computer, as well as a BoseLink input for connection to optional accessories such as the Wave Bluetooth adapter (£130), Wave Connect iPod/iPhone dock (£130) and Wave multi-CD changer (£300). You can buy the Bose Wave Music System III in silver, white or grey and the Wave Radio III in white or grey.